Gene Autry was more than a musician. His music, coupled with his careers in movies and on radio and television, made him a part of the mythos that has made up the American identity for the past hundred years -- John Wayne with a little bit of Sam Houston and Davy Crockett all rolled into one, with a great singing voice and an ear for music added on. He defined country music for two generations of listeners, cowboy songs for much of the 20th century, and American music for much of the world. He was country music's first genuine "multimedia" star, the best-known country & western singer on records, in movies, on radio, and on television from the early '30s until the mid-'50s. His 300 songs cut between 1929 and 1964 include nine gold record awards and one platinum record; his 93 movies saved one big chunk of the movie industry, delighted millions, and made millionaires of several producers (as well as Autry himself); his radio and television shows were even more popular and successful; and a number of his songs outside of the country & western field have become American pop culture touchstones. Autry didn't immediately give up his job, but just over a year later he was in New York auditioning for a representative of RCA Victor. The judgment was that he had a good voice, but should stay away from pop hits, find his own kind of songs and his own sound, and get some experience. He was back six months later, on October 9, 1929, cutting his first record, "My Dreaming of You"/"My Alabama Home," for Victor. Two weeks later, Autry was making a demo record for the Columbia label of Jimmie Rodgers' "Blue Yodel No. 5." Present that same day in the studio were two up-and-coming singers, Rudy Vallée and Kate Smith. Autry found himself being pressured to sign an exclusive contract with Victor, but chose instead to sign with the American Record Corporation. Their general manager, Arthur Sattherly (who would later record Leadbelly, among many other acts), persuaded Autry that while Victor was a large company and could offer more money and a better marketing apparatus, he would be lost at Victor amid its existing stable of stars, whereas ARC would treat him as their most important star. Additionally, Sattherly -- through a series of arrangements involving major retail and chain stores across the country -- now had the means to get Autry's records into peoples' hands as easily as Victor. 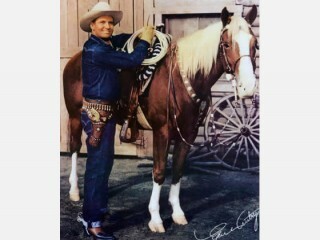 View the full website biography of Gene Autry.